I love to read the names of paint chip samples and crayons. It's amazing how the names of colors instantly conjure a memory, a smell, a taste. I don't even have to see the color; the name is enough. As a small girl, my mom would occasionally take us to the Hallmark store down the road. They had a large display of limited edition Crayola crayons. These crayons were ten cents a piece and my mom would always let me pick out a few. It was such a treat! 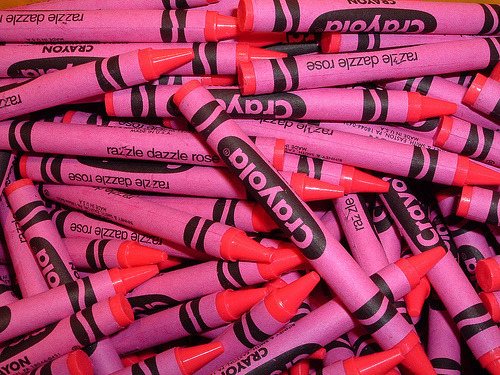 Has there ever been a color more perfect than "Razzle Dazzle Rose"? As a teenager, I literally painted my nails a different color every day. That was in the late 90s when nail polish shades other than pink and red became the rage. I was obsessed with candy-colored nail polish. Mint green, sky blue and lavender were among my favorites. Unfortunately, back then, the local Revco didn't always have the colors I wanted or imagined. So, I began trying to make my own nail polish. Starting with a white or clear base polish, I added food coloring, ink and acrylic paint; all of which were messy failures. I figured out powdered eyeshadow added some color and glitter but refused to stay mixed. Despite rigorous shaking and refrigeration, the shadow would inevitably float to the top, like olive oil in a bottle of Italian salad dressing. As more colors became available, I realized mixing with other nail polishes was the only way to go. One time, I even designed my own "line" of nail polishes. I mixed different colors and painted a little circle in each color on a piece of white foam core. Underneath each circle, I wrote out the name of that color . . . I can't remember what I named them but I'm sure they all had some sort of sugary dessert inspired name. It's almost delicious how language and color work together. That's why I make the things I make. My purses and jewelry are a fun marriage of the two things I love best: literature and art. 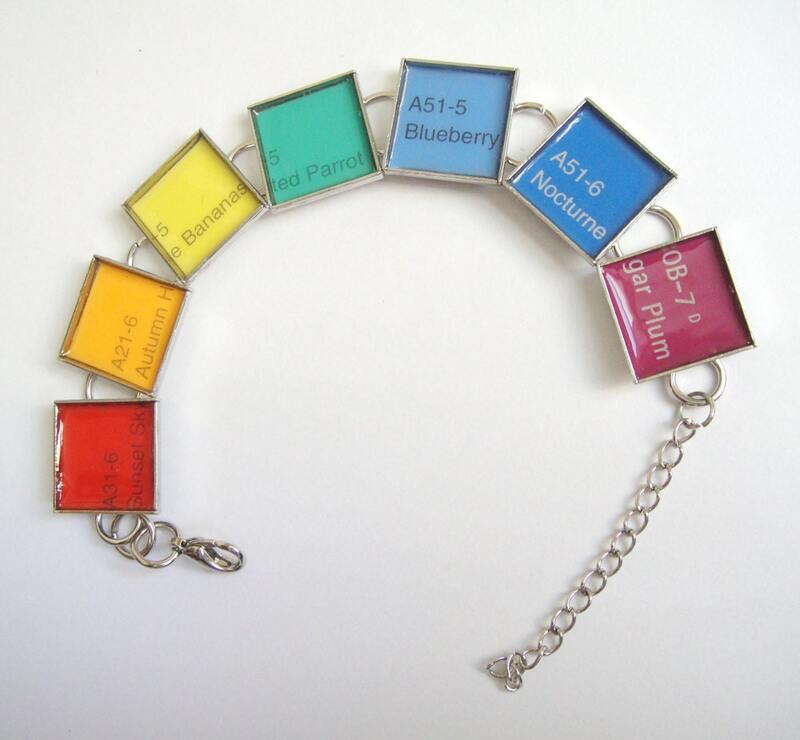 One of my newest items is an exercise in language and color. 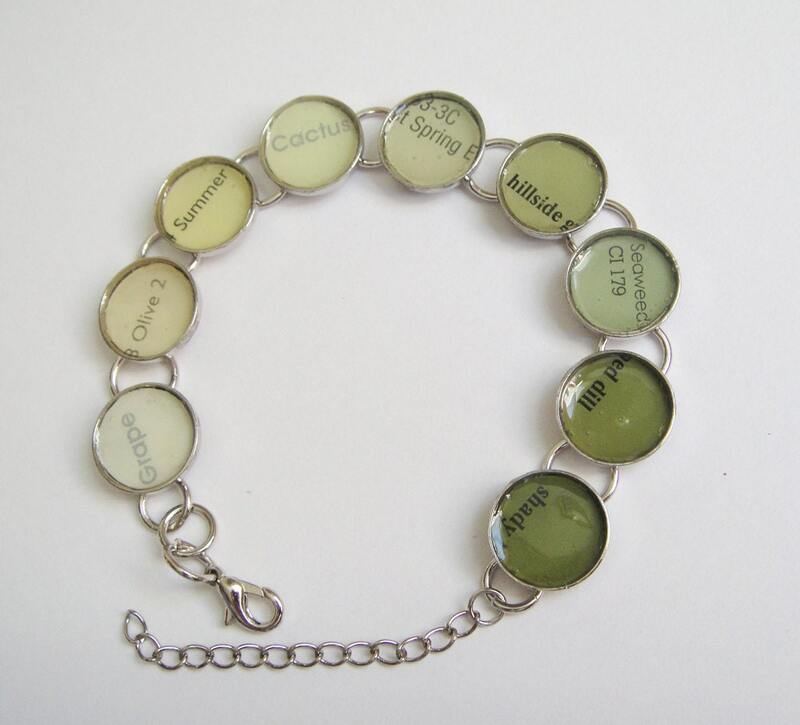 I started making these bracelets from paint chip samples. Each one is a play on words. I love to group several hues and shades of one color to demonstrage the range of language used to describe it. 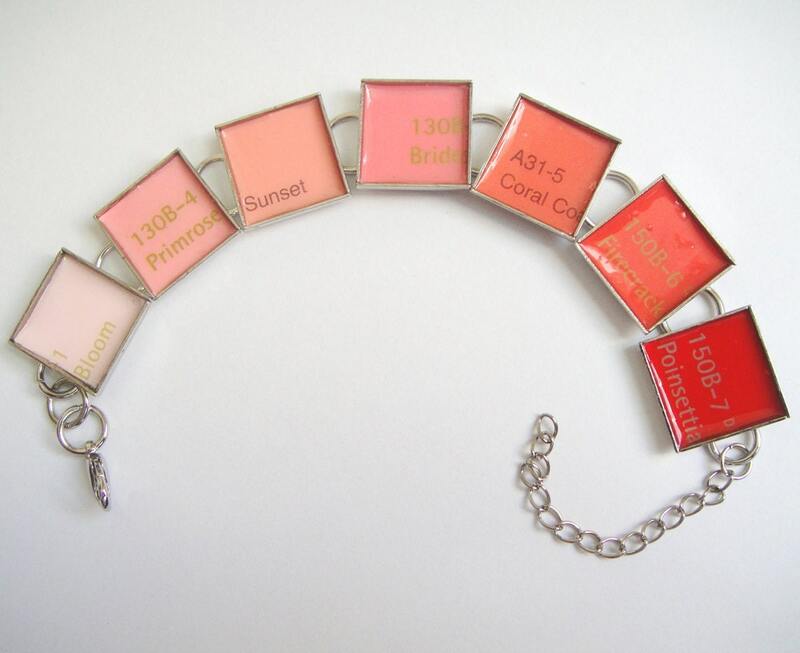 For example, I have a pink bracelet and the names range from "Bloom" to "Firecracker." This month I was inspired to do my own take on Conversation Hearts. While I'm not a fan of the lame sentiments (of which are horribly misspelled for the sake of cuteness and space) featured on the candies, I do love that they come in a variety of fun colors. 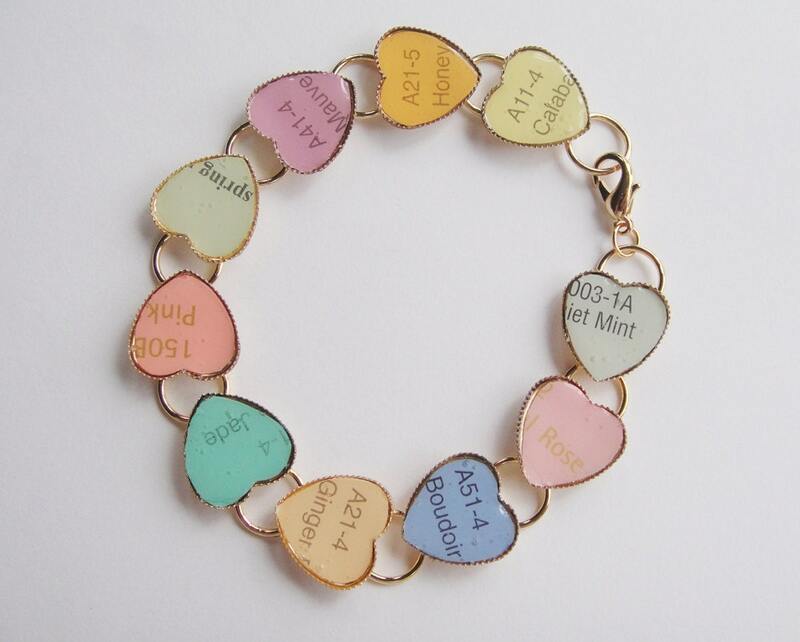 I used a heart charm bracelet and put pastel colors in each heart. Instead of a cutesy sentiment, each heart features a paint name and code. I'm not a huge fan of hearts but I do love this bracelet! What colors would you like to see in one of these bracelets? The traditional abdominal exercise such as crunches and curl ups. These exercise balls can also engage the muscles of your core while performing other exercises. That zeal quickly fades as the days and lack of desire drag on. Jessica--I get mine at Hobby Lobby.